There are lots of different equipment configurations with which you can do RSpec spectroscopy. Below are some suggestions. We haven’t tried them all, but these are the kinds of approaches we’ve seen in use. Are you new to spectroscopy? An RSpec user, Iain Petrie, has written a very valuable, two-part introduction to the field. Read his posts from the bottom of each page to the top for chronological order. Set one: link. Set two: link. Have questions? Fill in our contact form (link) to have our Help Desk experts email you. We specialize in getting newcomers up and going. Also, see the short video here to see information about the free webinars that Field Tested Systems offers. These webinars are a complete introduction to the fundamentals of spectroscopy, the equipment needed and the kinds of scientific results you can expect. 1. RSpec software: you can download a free, fully-enabled 30-day trial version of RSpec from this link. If your trial period runs out, just send us an email and we’ll be happy to provide you with an extension. You can also purchase a copy in our store: link. Even without clear skies or the necessary diffraction grating, you can get started today with the trial version and a sample spectrum you can download by right-clicking and saving the file at this link. This is a .png file, but RSpec hands FITS files too! Also see link for sample files and a YouTube video of a workshop Tom gave on processing. 2. Diffraction Grating: We recommend the Star Analyser 100. 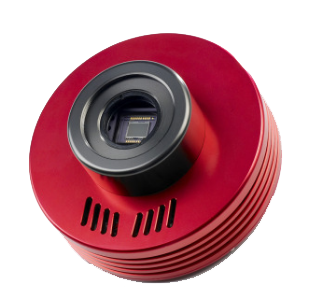 It comes mounted in a standard 1.25” filter cell which screws into your CCD imaging camera, your telescope’s filter wheel, or the nose piece of your video camera, or your DSLR. With 100 lines/mm, the Star Analyser 100 was specially designed amateur spectroscopy. Details: link. RSpec can process real-time video, or FITs, JPGs, BMPs, TIFs, RAW images from any source including DSLRs and your current astronomical CCD. Video Cameras: RSpec can process static images, or real-time video. If you want to do real-time video, you’ll need a DirectX-capable video camera. For inexpensive video, we recommend cameras from ZWO: the color ZWO ASI120MC-S ($159, link) or mono ZWO ASI120MM-S. ($199, link). Other cameras: For a bit more sensitivity and general performance, see the ZQO ASI190MC ($299) and ASI190MM ($399). RSpec can also show live video spectra from Imaging Source cameras, Mallincams, Orion All-in-One camera (using their Live Broadcast/WDM drivers), and the QHY5-II series and QHY5-III series of cameras. Have a DSLR? For video, see www.sparkosoft.com to use RSpec with a live DirectX feed from your DSLR. Mono or color? If you’re doing public outreach or teaching with RSpec, we recommend a color video camera so that the RSpec video preview of the spectrum is the more interesting and intuitive rainbow rather than just black and white. Mono cameras can produce more detailed spectra and are more sensitive, but a grey smudge is a lot less engaging to newcomers than a colorful, rainbow spectrum. If you already have a astronomical video camera that you use with your telescope, if it can accommodate a 1.25″ filter cell for the diffraction grating then you probably have all you need. To get the best spectra, the grating should be located at the optimal distance from the CCD chip – see our calculator (link) and read about spacers at this link. Note: Beware of the Orion Starshoot Solar System Camera. This camera’s driver turns off the screen if not enough pixels are illuminated. This is a good design when imaging bright, large solar system objects. However, on the sparse, dim star fields we see when capturing spectra, this camera’s driver turns off the camera, preventing you from capturing spectra data. Using your DSLR as a live video camera: The Canon 450d and other DSLRs can generate live video. With many cameras, the addition of an inexpensive converter (to DirectX/DirectShow) as described above lets you feed real-time video from your camera into RSpec. This configuration can get remarkably good results and is extremely simple to setup. Still Cameras: Although real-time spectroscopy using live video is easier and considerably more exciting, a standard astronomical FITS camera will allow you to capture dimmer objects. Do you have an astronomical FITS camera already? RSpec will read and process FITS images from any camera. Looking to upgrade your camera or buy a new one? Cameras like the popular Atik 314L+ cooled astronomy camera (link) to the left often work “out of the box” with no modifications. With many cameras, you simply thread our 1.25″ Star Analyser 100 grating into the nose piece threads of the camera. If you’re using a filter wheel, you can use our Star Analyser 200 grating. For more information on gratings, see this link. In addition to astronomical FITS camera images, RSpec can process RAW, JPG, and BMP images from, for example, a DSLR. You can configure RSpec to automatically load each new image file as your camera saves them to a specific folder on your hard disk. We offer special adapters ($38) to mount a grating on your DSLR: link. Computer: RSpec runs on almost any Windows computer (1+ megs of RAM, XP through Windows 10). For larger format cameras or live video, you’ll need a computer with a bit more processing power than the low-end, low-power mobile Celeron-type chips. RSpec handles FITS, jpg, bmp, png, and raw images straight out of the box. For video cameras, the camera needs to produce DirectX video output. Most of the popular astronomical video cameras (like Mallincam, NexImage, ZWO, etc.) come with DirectX drivers. For other cameras, ask your vendor about DirectX capability. We’re always happy to answer any questions you may have. Please forgive us for suggesting one last time: Ask us questions! Use our live chat form to talk to us directly: link. Or, you can use our contact form (link). Don’t be shy — we love answering questions! Also, our Yahoo forum is a great source of information: link. I love this program so much that I translated it into Italian! I’m still amazed at what I’ve been able to do with the Star Analyser grating and a small telescope. With just an 8″ SCT, your Star Analyser grating and RSpec software, we’ve been able to study the stars! There’s almost no learning curve to get started, but this software has a ton of power when you need it. I don’t normally write emails like this, but I just wanted to thank you for the great software and for answering all my questions so quickly. Great support! If an old man like me (I’m 84 years old) can learn to capture star spectra, then, hell, anyone can. The tutorial videos walked me through it step-by-step.